eBible is an awesome online Bible site. I've been using it for several months now and have really enjoyed the features and the fact that they are always adding new features. I did have one problem though. 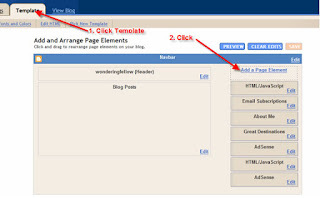 Every since I have upgraded my blog on Blogger I haven't been able to get their eBiblelicious API to work. 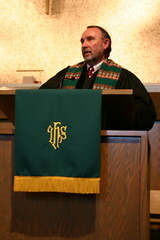 It allows you have your scripture refences embed into your post. When someone does a mouseover the reference, a small window will appear with the verse!! 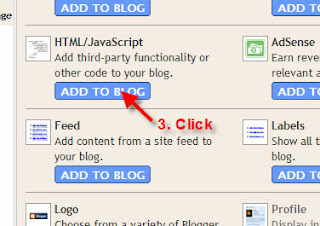 Once your Blog has been upgraded you will have the ability to add widgets. But it’s a little different to add the Ebiblelicious code. Click on the Template tab. Click Add a Page Element. 4. 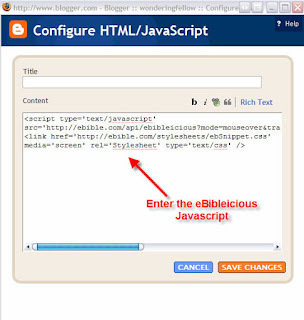 Enter the eBibleicious script. Don’t enter a title then click Save Changes. How do I change the script to make the mouseover automatically show the TNIV instead of NIV? Woot! I use FTP hosting and straight html, but my pastor is setting up to use Blogger Layouts and wanted me to get his blog to use the eBible scripts.